Their stories can only be guessed at, but even the smallest glimpse provides a fascinating look at the history of women in music. Many of the smaller groups discussed in this paper came to light through investigation into a collection of touring show memorabilia housed at the University of Iowa, containing more than 7900 concert programs, posters, flyers, and photos.4 This collection, and others like it, casts a wide net over many thousands of touring groups over an eighty-year period, and may not be truly representative of the nation as a whole at any particular time or place. Rather than attempt to address the collection as a whole, this paper will discuss a selected group of materials, those which showcase women brass players as soloists or ensemble members. The material gives us an important look not only at who was out on the nation's stages during this era, but some of what was being written about them, and what they were writing about themselves. One challenge present in the historical research on women in music is the issue of professional versus amateur. It has often been assumed women did not work professionally for pay, but for the general love of music itself. This is an important distinction, as the line of money, power, and influence runs across this divide as well. Women's work is "one of the most misunderstood and underestimated facets of women's lives," and has been historically undocumented.5 Work is an ever-changing action, and women have moved in and out of the public labor force as opportunity and economics dictated. In the field of American music, little is known about women's early experiences in the labor market. It is hoped that the material presented in this article, and the fascinating glimpse into a past world it provides, will inspire more research into the area of paid performance work by women musicians in the early part of the twentieth century. In the post-Victorian era, most people associated women on stage with the chorus line and burlesque shows, and this caused women instrumentalists to market themselves in specific ways. The marketing strategies revealed in publicity materials demonstrate how carefully women had to work around common perceptions of women in musical theater, by continually emphasizing their class and professionalism. Elaborate costume and presentation were an important part of the performances, and the programming was carefully planned to appeal to the widest possible audience. The result was an effort on the part of many of these women musicians to make themselves appear as feminine and ladylike as possible through costume and elaborate hair and make-up styling (see Figure 2). The marketing of musical acts is certainly much the same today, as considerable sums are spent on glossy photos and flyers designed to sell recordings and concert tickets. Both male and female musicians use whatever they can to sell their act, and many female artists today choose to wear gowns or present themselves in glamorous ways in an effort to stand out from the crowd. The beginnings of this can be seen in vaudeville more than a century ago. While the very existence of these groups challenged the prevailing assumptions about women and brass instruments, at the same time they went out of their way to reinforce their conformance to accepted notions of femininity. As these musicians began to market themselves nationwide, they attempted to come as close to the Victorian ideal as they could while playing a brass instrument. By placing a strong emphasis on class and femininity, groups hoped to remind audiences that they were really little different from the accepted upper-class lady playing quietly and demurely in her drawing room. By keeping themselves in the sharpest possible contrast to the all-male groups, women brass players seemed less of a threat to the established order. By placing the theater-and-entertainment aspect first, these groups were able to work nationwide for many years without directly challenging the existing professional orchestras, which did not accept women. Vaudeville touring circuits offered women real playing opportunities and the possibility of paid work playing their horns. 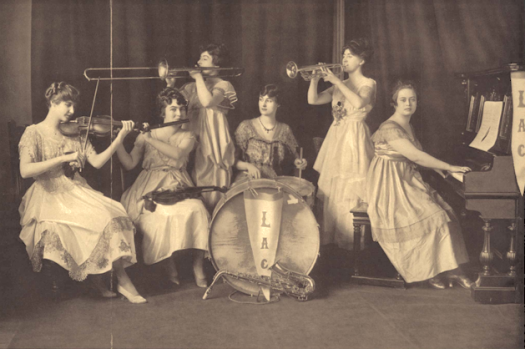 The period between 1880 and 1920 was an important time of change in the United States, and it is no accident that this change coincided with the arrival of women brass performers as a permanent part of the music scene. As Robert W. Snyder notes, "the turn of the century marked a watershed in the history of American popular culture. "6 The nation was in transition. The nineteenth century, with its roots in a farming economy and small towns, was giving way to industrialization and growth of cities. More women began to join the workforce outside of the home, providing themselves with independent financial support. Even in an agricultural economy such as West Virginia, the percentage of women working outside the home doubled between 1880 and 1890.7 Immigrants poured into the country and the culture simply had to change. Victorian ideals were no longer appropriate, if they ever had been. Mass media was on its way and Americans had leisure time and some change in their pockets to spend on entertainment, fantasy, and laughter. Vaudeville shows were the result of a society attempting to make sense of it all, providing a place to redefine cultural values and priorities for a new century. Vaudeville was all about making money, and business was good. By 1900, there were an estimated three thousand theaters in the United States, providing a home for between eight and ten thousand variety show acts which toured the country each year.8 In New York City, eighty-nine new productions opened on Broadway during the 1899-1900 season alone. In addition to the circus, minstrel shows, museums, and taverns that provided entertainment, the development of a traveling theater circuit made agents and a few lucky artists richer each year. A "centralized vaudeville empire," in place by the turn of the century, sent musicians on a prescribed route which provided a simple concept, "stage shows with something for everyone. "9 This touring circuit provided an opportunity to men and women alike. If you could do something people would pay money to see, you had a shot at fame and fortune. As Snyder notes, "despite the odds against success, vaudeville was egalitarian in a competitive way. Vaudeville was far more open than the formal professions: the key criterion for success was the ability to put an act over. "10 People everywhere were star-struck and there began a "surge of young girls to the stage. "11 Some of them brought their trombones. For women, this period of change had far-reaching consequences. Described as the era of the "New Woman," the early twentieth century saw more young women getting an education, joining the workforce, and making lives for themselves that were in contrast to the Victorian ideal. It was not until August of 1920 that the nineteenth amendment to the Constitution was finally passed and women were granted the right to vote. As Virginia Sapiro has noted, "It is difficult to identify an area of life that was not in some way touched by feminism in the late nineteenth and early twentieth centuries. "12 In her work on all-female orchestras in the 1920s and 1930s in the United States, Carol Neuls-Bates has demonstrated the increased work of women musicians in the early part of the century, when "significant numbers of women put themselves forward as players and conductors, establishing their own institutions when necessary to secure experience and gainful employment. "13 The new century meant new opportunities, at least for white women. Women of color and immigrant women did find increased opportunities in the entertainment industry as well, but also experienced discrimination and segregation. Non-white brass musicians played in separate groups even as late as the 1950s. Women were questioning the prevailing assumptions not just in the field of music, but in all aspects of their lives. The "New Woman" was now able to reevaluate "her relationship to both home and a career, as well as men and marriage. "14 It is no surprise, then, that women brass players participated in this era of cultural change in large numbers. They represented the cutting edge of musical opportunity for women. While some may have been young girls away from home for the first time, taking advantage of the increased opportunities for single women in the new century, others were seasoned professional musicians. Not afraid of travel and the hardships of being on the road, these women wanted to work in music, and if their ticket to success lay in their ability to perform in a band dressed in Scottish kilts, then that was what they did. These young women studied intensely, often with European-born instructors, as was the custom, and performed in high-caliber student orchestras. There was only one problem. Where were they to perform after graduation, when the nation's established orchestras excluded women? Female graduates of the nation's conservatories needed a chance to gain experience and make music, and as they were barred from existing groups, they began to create their own. While many large all-female orchestras and bands were performing during this period, there were also numerous smaller chamber groups formed by a few friends, sisters, or family members. The novelty factor of women brass players was a sufficient draw for audiences, but if they also gave a great concert, that was better still. The Metropolitan Musical Club, a "ladies orchestra with singing," was dubbed "an attraction of unusual merit"16 when it toured the nation around 1915. The fact that these performances were "out of the ordinary"17 allowed them to offer something these American small towns may never have seen before, and the publicity material made the most of this. Judith Tick has documented the existence of seventeen all-female orchestras in New York and Boston between 1871 and 1898, many of which continued into the new century, to perform as well as inspire the creation of new groups.18 The Musician's Union did not accept women members until legally required to do so in 1904, when it joined with the American Federation of Labor. 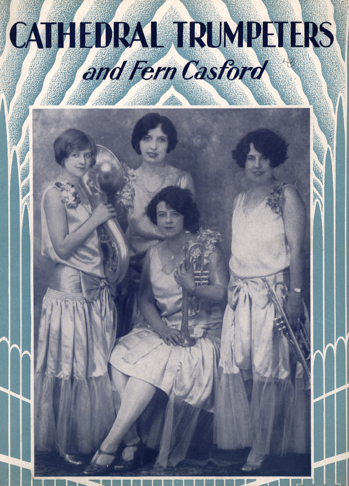 Fern Cashford, an actress who toured with a brass quartet around 1920, took advantage of the novelty of brass instrumentalists to promote her show. 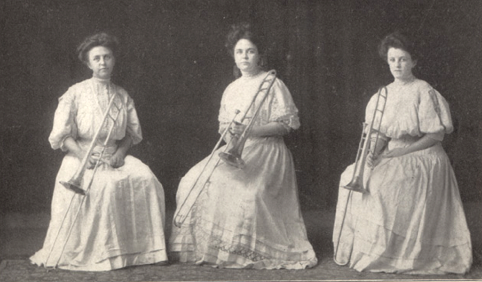 The Edna White Trumpet Quartette, first organized in 1914, had been a popular touring group on its own when it decided to combine forces with Cashford (see Figure 4). This "exceptional group of versatile musicians and entertainers" were of "unusual musical feeling, ability and skill. "22 That their ability and skill was unusual may not have been completely accurate, but it played on the public's assumptions regarding women musicians. Ignoring the fact that no woman was playing trumpet anywhere in the country with an established male orchestra, the group simply advertised the qualities of these instruments and left it at that. The quartet was a combination of trumpets, horns and a euphonium and was "ideal and quite different from that found in an ordinary company. The soft tones of the horns are brightened by the more brilliant and heroic notes of the trumpets, producing a colorful and delightful blending of tone. The instruments adequately fill the largest auditoriums, and because of the technical possibilities of the trumpets, and their inherent vocal quality of tone, the organization is admirably adapted for concerts. "23 While the use of terms such as "heroic," and "technical" do not fit with a feminine and ladylike image, this group was successful partly because of their attention to costume, which was used to help counteract these more masculine qualities. As entertainment historian Albert Auster has noted, in the great chaos which was vaudeville, "the importance of costume cannot be overstated. "24 After all, theater was about taking the audience away from the everyday. Vaudeville star Sophie Tucker gave the following advice to young women trying to succeed; “[I]f you ever get on the stage, think of clothing, look smart, it helps you out.”25 Women brass players who played in musical touring groups took their cue from the actresses and entertainers of the day and made costume a large focus of their acts. When long Victorian dresses were the fashion, women brass soloists appeared in silks and chiffons with their flounces and ruffles trailing the floor (see Figure 5). As women's skirts began to shorten in the early twentieth century, musicians followed suit, showing dainty satin shoes and silk stockings. In the flapper era, when young women began to bob their hair in rejection of outdated Victorian ideals, so too did brass players. With carefully curled hair, satin dresses, floral corsages and elaborate make-up, brass quartets and other groups performed in theaters nationwide. While using costume to give them an edge in the competitive entertainment market, women brass musicians also used their appearance to downplay any masculinity or sexuality that might be construed from their performance on less-feminine instruments. This is perhaps an explanation of the lack of female tuba players on the smaller stage. While women tubists were performing with the larger groups whose instrumentation required them, smaller chamber groups did not often use the instrument. It appears that if they could get away without it, they did so. While cornet, horn, trombone, and even euphonium are seen played by women in these traveling acts, the tuba did not find a place to the same extent. The tuba may have been simply too difficult to fit into the ladylike image created by these smaller groups. The emphasis on make-up, hair styling, and pretty dresses served the performers well in the short term, but had negative consequences in the long run. By making the most of the differences between themselves and the male professional musicians of the day, these women exaggerated the contrast to such an extent that it made the stereotype of women's weak and frivolous nature seem all the more believable. Concert programming was carefully selected to appeal to the widest possible audience. It was common for the women to double on various instruments or to sing a well as play, thus giving a wider variety to the concert (see Figure 6). 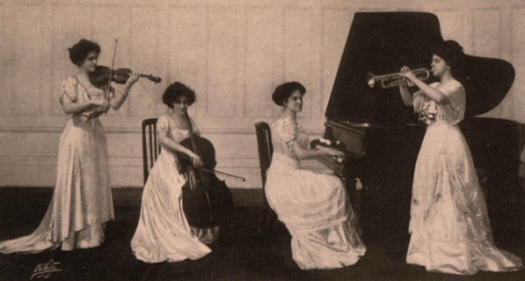 In 1913, the four-member Maurer Sisters Orchestra advertised performances on cornet, flute, piano, violin, and cello, using the slogan "Versatility without Mediocrity. "31 This concept can also be seen in the program of the Hearons Sisters, a quartet who performed on brass, woodwind, and string instruments. Winifred Hearons "perhaps the most versatile of the four, delighted the audience not only with her cornet and mandolin playing, but as a reader. "32 It was common for concerts to feature dramatic readings or vocal music in addition to the instrumental selections. Groups such as the Bostonia orchestra featured a "story teller," often male, who "was an especial favorite with the big crowd and kept his audiences in laughter during his frequent appearances. "33 Soloists, brass quartets, and bands of all sizes and instrumental combinations played the most popular music of the day (see Figure 7). The programs were "composed of orchestral selections, instrumental solos, vocal quartets, duets and solos, and readings. "34 The Lyceum Arts Conservatory Orchestra advertised a program "which is extremely well selected and contains sufficient variety to fulfill all requirements" and which "could be classed as popular, with a few pieces of the heavier sort. "35 Overtures, arrangements from Mozart operas, folk songs, hymns, and orchestral pieces by composers such as Verdi, Rossini, Faure, and Gounod were featured. The smaller groups did not appear to be hampered by their size. The Chicago Ladies Orchestra toured performing orchestral pieces in scaled-down versions. Pieces such as the overture to the Merry Wives of Windsor and Wagner's Tannhauser met rave reviews. The Evening Mirror of Warren, Pennsylvania was pleased with the group's performance, noting, "though composed of but ten pieces, it was fully equal to the work required of it. This was especially so in the Tannhauser selection, which requires a large number of instruments to produce the heavy volume. "36 One wonders what Wagner, who composed some of the most challenging and brass-heavy compositions in classical music, would have thought hearing his piece, originally scored for large orchestra including a ten piece brass section, rendered by a group of ten people total, with only a trumpet and a trombone for brass. These groups did what they needed to make the music work, and the result was "lively, well-balanced"37 programming that was entertaining. Brass quartets were a popular addition to concert programs and often received comment from the press. The Cleveland Ladies Orchestra featured a brass quartet as part of their concerts, on one occasion providing a "unique and highly pleasurable" performance that "made a lasting impression with the tender and sympathetic strains of the Lost Chord,"38 The Lost Chord, by Sir Arthur Sullivan, was also on the program of the Cathedral Trumpeters, a group which "plays beautifully" a "wide repertoire of...concert and sacred numbers. 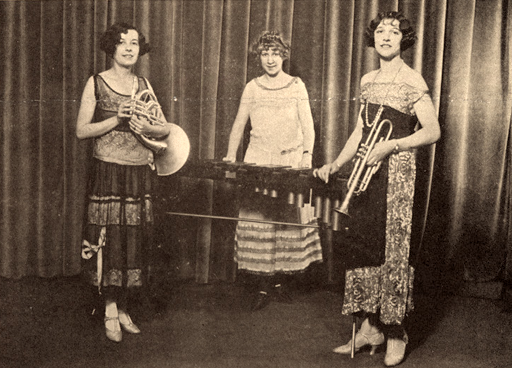 "39 The horn quartet which was featured in performances of the Chicago Ladies Orchestra was unique, in that it contained a male performer, Louis Runner, the group's musical director. Rather than promoting a feeling of equality, though, this group's publicity material made clear that Runner was in charge, with a group of pleasant young ladies at his disposal. This ensemble emphasized Runner's superiority with a photo depicting the seven women and one man involved in a tug-of-war (see Figure 8). On one side, the women are gathered together, in lovely gowns, with no instruments in sight. 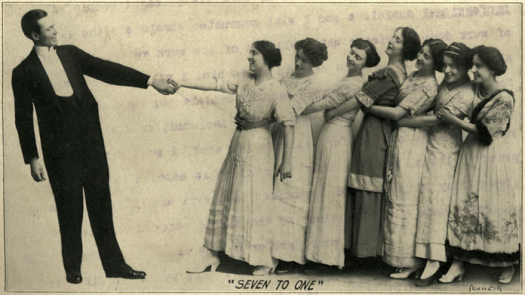 Runner, appearing in exaggerated size compared to the ladies on the other side, has no difficulty seeming superior to the group, despite the caption, which reads "seven to one. "40 While the male leadership removes much of the power from the women musicians and reinforces the stereotype that women need a man to lead and protect them, the group is notable as one of the few where men and women performed together in a brass section. Class became a central marketing point for these groups. Over and over again publicity brochures, posters and concert programs emphasize the class status of these musicians. The limits Victorian society imposed on the activities of women who wanted to be considered ladies, enforced through the media and the courts, attempted to define acceptable and unacceptable behavior sharply. Women on the stage were unable to meet these criteria; they had jobs outside the home and were financially independent, they were often to be found in the company of men, they were out at night unescorted, and their profession required different and perhaps more risque clothing. In addition there was an assumption of sexual availability of women who put themselves on display on stage. The actress's "mobility and professional equality"41 did not fit with the Victorian image. Women musicians felt the need to separate themselves from the average actress or dancer and used sophistication and professional skill as marketing tools in an attempt to downplay the sexuality inherent in a woman stage performer. As has been mentioned, many of these women paid such close attention to image and costume that in reality they probably looked little different from the dancers and actresses of the time. This was all the more reason to emphasize their musical skill and do whatever they could to seem different, and better, than everybody else. The Chicago Ladies Orchestra toured the country making sure audiences understood just what they were, or perhaps more importantly, were not. "The entire personnel is made up of members of standing and marked ability, professional musicians, capable of playing with the best musical organizations in America,"42 boasted their publicity material. 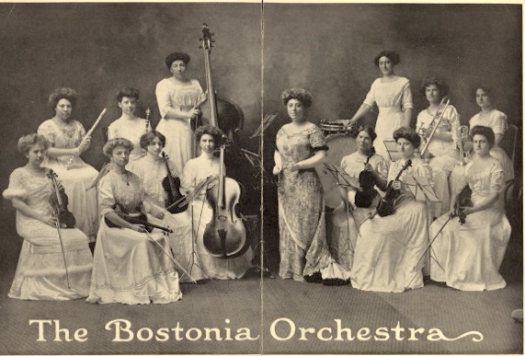 In 1911 the Bostonia Orchestra advertised "good taste and judgment,"43 and the Pittsburgh Ladies Orchestra claimed they worked "under high ideals and motives. "44 In an attempt to signal professional status the Aida Quartet, of New York (see Figure 2), advertised in 1916 that its members had played with John Philip Sousa and his band, and that their program was "of high standard. "45 It is unknown if this group did in fact perform with Sousa, there is no evidence that they did so, and the publicity material does not list a time or place for the event. While female artists such as cornetist and conductor Helen May Butler had indeed performed with Sousa and made the most of it, the lack of factual information in the instance of the Aida Quartet leads us to doubt. Class, in addition to gender and race, is one of the major ways society divides and organizes itself, and has commonly been used to refer to wealth and control over resources. For women, class has historically been defined by either a father or husband and his place in society. Class distinctions such as white-collar or blue-collar have historically been defined by male professions. For Americans around the turn of the twentieth century, these distinctions became all the more important, as immigration and a changing economy threatened the security of many. Class became identified not only with a type of job and income level, but also with a set of behaviors. People wanting to set themselves above others, establishing a new hierarchy for the new century, promoted these behaviors. One of the most important factors was clothing, which could identify one with a class level instantly. Another central belief was that only women of the lowest classes worked for pay. While certainly many people kept the business of Vaudeville rolling by paying to see women performers of all social classes, it is indicative of the strong class lines present during this period that these musical groups went out of their way to identify themselves with "a high and refined class of entertainment. "46 Perhaps the high-class label was an attempt to make the public more comfortable with the idea of women performers, as music had long been a leisure activity of the upper classes, an indication of status. Or perhaps it was simply economic. As vaudeville shows began to target larger audiences, women of the upper classes were seen as an untapped market. If the performances could be advertised as clean, upstanding, and proper, tickets could be sold to larger numbers of people, including families with children. As the vaudeville empire grew, more women paid for admission, and the shows, which began in taverns and dance halls, branched out into more legitimate concert productions. In addition to their class and femininity, these groups often employed special marketing strategies designed to appeal to audiences. 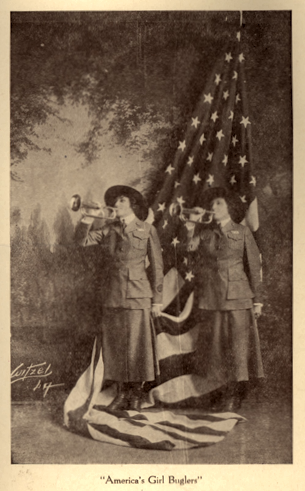 Many groups felt that featuring patriotism gave them a special edge, especially in the time during and after World War I. Alberta and Lorene Davis, two sisters who performed duets and solos on cornet and euphonium, among other instruments, included a photo in their brochure which depicted the two women in military costume playing bugles in front of a huge American flag (see Figure 9). Another musical group, calling themselves the Overseas Ladies Orchestra, toured the American circuit advertising that they had come straight from the "Y.M.C.A. huts in England and France, entertaining for the American Expeditionary Forces," prepared to give home audiences "an idea of the programs the boys liked. "47 The group toured with cornet soloist Helen Ferguson. According to the group, "the boys in the service have accepted Miss Ferguson's work with unbounded enthusiasm,"48 so home audiences could hardly be expected to do less. As a marketing strategy it was a clever move. In case audiences might not be eager to welcome a woman brass soloist, it was implied that to do so would be unpatriotic. While recent scholarship has explored the lives of women musicians during World War II, there were women brass musicians performing during the time of the First World War as well, sixty years before they would be permanently admitted into the United States military as musicians. Some groups felt that assuming an international flair would give them an advantage. The Phillips Sisters Orchestra advertised "classical and popular concerts"49 on a publicity poster depicting the six women in elaborate Scottish costume, complete with kilts and dashing hats trimmed in tartan. The instrumentation of the group consisted of a violin, clarinet, cornet, trombone, drums, and bagpipes. 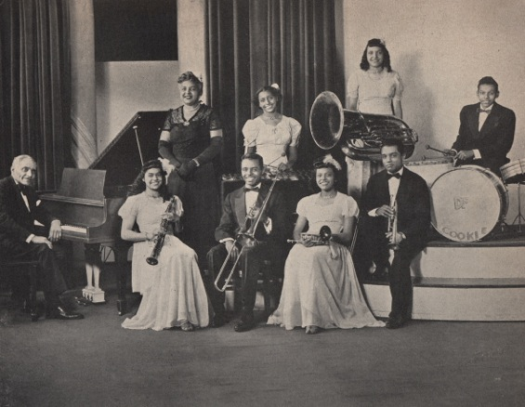 The Dungill Family Concert Company, which began touring in the 1920s and continued into the 1950s, was an African-American group which advertised a widely varied ethnic background (see Figure 10). While the female brass musicians employed by these traveling companies were able to earn a salary and play music for a living, they did so completely separated from the established professional orchestral and concert band system in the United States that would not admit them. The vaudeville circuit provided a way to work despite the barriers, though there were major drawbacks. Women were required to emphasize their looks and had to conform to the accepted standards of beauty of the time, and carefully planned costume and concert programming around what would sell the most tickets. Women had to accept that they might not be taken seriously until after their performance was over and they had their chance to prove their skill, if at all. The novelty of their career, while exciting, was also a drawback, as it seemed to prove the old stereotypes right. The more these women emphasized their gender, the more they were getting away from the qualities everyone thought were needed to play a brass instrument. With the development of Hollywood as the new center for theater and entertainment, the traveling vaudeville show became a thing of the past. By the 1940s, the era which had seemed so positive for women's issues was over, and World War II loomed on the horizon. People forgot that flappers formed brass quartets and that bands to rival Sousa used to travel the country with women brass players in long ruffled dresses, who had to figure out how to play their instruments while looking like ladies. 1 Robert W. Snyder, The Voice of the City: Vaudeville and Popular Culture in New York (New York: Oxford University Press, 1989), 132. Collections. A searchable database can be found at <http://memory.loc.gov/ammem/collections/chautauqua/>. Information can also be found in the Boston Public Library's Brown Collection, which features scrapbooks, photos, and related documents for groups with a Boston connection. 5 Virginia Sapiro, Women in American Society (Mountain View, CA: Mayfield Publishing Company, 1994), 395. Recent work in the field of Women's Studies on the issue of women in the workplace has begun to fill in gaps of knowledge of women historically, and more research is certainly needed. 6 Snyder, Voice of the City,ii. 7 Frances S. Hensley, "Women in the Industrial Work Force in West Virginia, 1880-1945," West Virginia History Journal 49 (1990): 115-24. 8 Albert Auster, Actresses and Suffragists: Women in American Theater, 1890-1920 (New York: Praeger, 1984), 4. 9 Snyder, Voice of the City, 37. 11 Auster, Actresses and Suffragists, 4. 12 Sapiro, Women in American Society, 458. 13 Carol Neuls-Bates, "Women's Orchestras in the United States, 1925-1945," in Women Making Music, ed. Jane Bowers and Judith Tick (Chicago: University of Illinois Press, 1987), 365. 14 Auster, Actresses and Suffragists, 5. 17 Cathedral Trumpeters and Fern Cashford, publicity brochure, [19?? ], University of Iowa Library, Special Collection, <http://sdrcdata.lib.uiowa.edu/libsdr...=/cathedralt/1>. 18 Judith Tick, "Passed Away is the Piano Girl: Changes in American Musical Life, 1870-1900," in Women Making Music, 330. 19 The town of Shelbyville, Iowa, is listed in a county history as having once had its own post office, but is currently incorporated into the town of Shelby, Iowa. There are also Shelbyvilles in Illinois, Indiana, Tennessee and Kentucky. 20 The Allen Family Concert Company, publicity brochure, [190? ], University of Iowa Library, Special Collection, <http://sdrcdata.lib.uiowa.edu/libsdr.../allenfamily/1>. 21 Snyder, Voice of the City, 60. 22 Cathedral Trumpeters and Fern Cashford, publicity brochure. 24 Auster, Actresses and Suffragists, 54. 26 This newspaper review is quoted in The Hearons Sisters Concert Company, publicity brochure, [191? ], University of Iowa Library, Special Collection, <http://sdrcdata.lib.uiowa.edu/libsdr...?id=/hearons/3>. 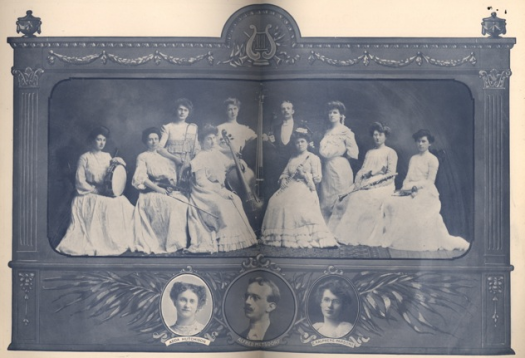 27 The Bostonia Orchestra Women Players, publicity brochure, 1908, University of Iowa Library, Special Collection, <http://sdrcdata.lib.uiowa.edu/libsdr...d=/bostoniao/2>. 28 The Lyceum Arts Conservatory Orchestra, publicity brochure, [191? ], University of Iowa Library, Special Collecton, http://sdrcdata.lib.uiowa.edu/libsdr...?id=/lacorch/1. 29 Cathedral Trumpeters and Fern Cashford,publicity brochure. 30 Chicago Ladies Orchestra, publicity brochure, [191? ], University of Iowa Library, Special Collection, <http://sdrcdata.lib.uiowa.edu/libsdr...hicagoladies/1>. 31 Maurer Sisters Orchestra, publicity brochure, [1913? ], University of Iowa Library, Special Collection, <http://sdrcdata.lib.uiowa.edu/libsdr...d=/maurersis/1>. 32 The Hearons Sisters Concert Company, publicity brochure. 33 The Bostonia Orchestra Women Players, publicity brochure. 34 The Lyceum Arts Conservatory Orchestra, publicity brochure. 35 The Lyceum Arts Conservatory Orchestra, publicity brochure. 36 Chicago Ladies Orchestra, publicity brochure. 38 Chicago Ladies Orchestra, publicity brochure. 39 Cathedral Trumpeters and Fern Cashford, publicity brochure. 40 Chicago Ladies Orchestra, publicity brochure. 41 Auster, Actresses and Suffragists, 57. 42 Chicago Ladies Orchestra, publicity brochure. 43 The Bostonia Orchestra Women Players, publicity brochure. 44 Pittsburgh Ladies Orchestra, publicity brochure. 45 Aida Quartet: of New York City, publicity brochure, 1916, University of Iowa Library, Special Collection, <http://sdrcdata.lib.uiowa.edu/libsdr...jsp?id=/aida/7>. 46 Chicago Ladies Orchestra, publicity brochure. 47 The Overseas Ladies Orchestra, publicity brochure, [192? ], University of Iowa Library, Special Collection, <http://apps.its.uiowa.edu/libsdrc/de...verseas/1&ui=1>. 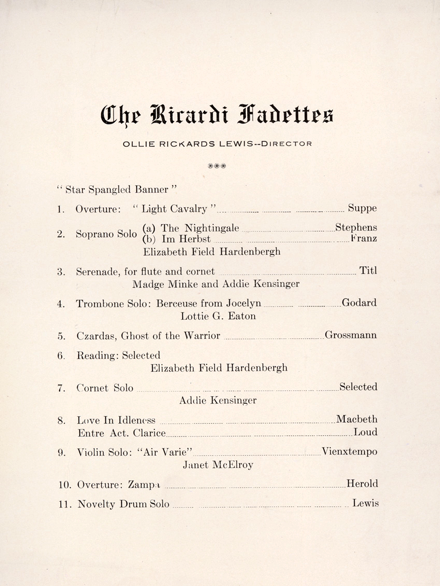 48 The Overseas Ladies Orchestra, publicity brochure. 49 Phillips Sisters Orchestra, publicity brochure, [195? ], University of Iowa Library, Special Collection, <http://sdrcdata.lib.uiowa.edu/libsdr...d=/phillipss/2>. 50 The DungillFamily Concert Company, publicity brochure, [195? ], University of Iowa Library, Special Collection, <http://sdrcdata.lib.uiowa.edu/libsdr...?id=/dungill/4>. 52 Snyder, Voice of the City, 54. 53 Sherrie Tucker has written many articles addressing gender and race in Jazz Studies, and her book Swing Shift: "All-Girl" Bands of the 1940s (Duke University Press, 2000) is a valuable resource in this area. 54 Linda Kerber, ed. U.S. History as Women's History (Chapel Hill, NC: The University of North Carolina Press, 1995), 5. 55 Ethel Pearl Mitchell, publicity brochure, [191? ], University of Iowa Library, Special Collection, <http://sdrcdata.lib.uiowa.edu/libsdr...=/mitchellep/1>.